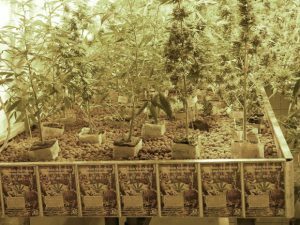 As law enforcement is battling a number of illicit and sizable marijuana cultivation efforts throughout Riverside County (rumors are its driven by Mexican drug cartels), leaders in some cities are working to take the power out of dealers’ hands by crafting a framework of regulation for lawful distribution. This is a notable shift from what we saw a few years ago, when hundreds of cities across the state scrambled to ban medical marijuana dispensaries amid a furious crackdown by federal authorities. Of course, the drug remains illegal under federal law, but U.S. attorneys have eased their stance on the issue, prompting cities to craft their own measures to replace the ban or allow ballot initiatives that gives voters the chance to decide. One of the most recent among these is Perris, where the council decided June 14th to approve a package of resolutions that will give voters a choice of not one but two medical marijuana dispensary November ballot initiatives to weigh. One of those measures offers a framework for taxing dispensaries that operate within the city and the other offers a proposal for how medical marijuana dispensaries in Perris will be regulated and supervised. Both measures required at least a two-thirds majority of council members – or four of five – be on board with sending the proposals off to voters. Several said they held their own personal beliefs about the measure, which largely leaned toward NOT allowing dispensaries to operate in the city. However, in the end the leaders decided it was best to let the voters decide. Councilwoman Rita Rogers was the single “No” vote on both matters, pointing out that medical marijuana dispensaries are operational in nearby Desert Hot Springs, Cathedral City and Palm Springs. She said Perris should resist the urge to become the first in the Inland Empire to climb aboard the bandwagon. But again, we’re not talking about a measure that allows for recreational cultivation, sales or possession (though that may be before California voters in November). Rather, this is about providing reasonable access to those who rely on marijuana as medicine. What’s more, Perris and Riverside County as a whole has seen the ill effects of the illicit drug trade. Take for example what was reported in Mead Valley not long ago, where an illegal marijuana cultivation operation was spotted just 50 yards from a playground. Such operations have been associated with high-powered weapons and in some cases, fatal shootings. And this is the kind of situation that makes reasonable, responsible marijuana laws so important. There will be a demand for the drug no matter what. That demand can be lessened – and the power of these cartels curbed – when we put control of it in the hands of the people rather than the criminals.